Yesterday, Stephen Hawking and Yuri Milner made the mind-blowing announcement that they want to build a fleet of interstellar spacecraft that can travel at relativistic speeds—up to 20 percent the speed of light. But it’s not just about reaching our nearest star system, Alpha Centauri, although that is the new Breakthrough project’s moonshot. The technology Hawking and Milner are proposing could revolutionize the search for alien life within our solar system. “This basically opens the door to missions that are much less expensive and cumbersome, that will allow us to get information currently not retrievable,” Avi Loeb, chair of the Harvard astronomy department and a collaborator on Breakthrough Starshot, told Gizmodo. That “currently unretrievable” information could include the first solid evidence of extraterrestrial life. So far, humanity’s exploration of the Solar System has involved large, expensive spacecraft that move rather slowly—at least, when compared with the speed of light. Missions like Cassini, Rosetta, New Horizons and Voyager have revealed countless wonders in our cosmic backyard, but each one has taken years if not decades of investment and planning to pull off. And for every scientific mission that makes the cut, dozens do not. Just consider a few of the space exploration concepts NASA was vetting last fall: a trip to a metallic asteroid, an exploration of near Earth mining prospects, a visit to the Trojan bodies around Jupiter, and two missions to Venus. These proposals were selected from a pool of dozens more. Later this year, one or two may be greenlit for further development, with the possibility of a launch by 2020. Any one would cost the space agency over half a billion dollars. Contrast the slow and pricey trajectory of interplanetary mission development with the rapid pace of discovery surrounding the potential habitability of our solar system’s real estate. There’s Europa, an icy Jovian moon and the focus of a longstanding science fiction trope about alien life. There’s Saturn’s moon Enceladus, which not only has a global ocean beneath its icy crust, it’s spewing free water samples out of a south pole geyser. Another Saturnian moon, Titan, is far too cold for Earth-like biology, but could be home to a different form of life entirely—perhaps microbes whose cells are filled with methane instead of water. Our solar system is also home to countless comets and asteroids that contain both water and simple organic molecules. Many astrobiologists speculate that the building blocks of life were delivered to Earth via rogue space rocks. Within these frozen time capsules, we stand to find answers to the question of whether we’re alone, but also, pieces of our cosmic origin story. If only we had the resources to visit hundreds of them. That’s where Breakthrough Starshot comes in. The project, which launched yesterday with a $100 million initial investment, aims to develop spacecraft that weigh only a few grams but carry scientific equipment capable of doing everything from taking photographs to analyzing biological samples. Propelled by meter-sized, razor-thin lightsails, Milner’s “nanocraft” would be as cheap and expendable as NASA missions are expensive and precious. By punting them out of orbit with a 100 Gigawatt laser pulse, we could in theory accelerate the wee spaceships to 20 percent the speed of light. In addition to the sheer number of targets a swarm of tiny spacecraft could hit, flying at relativistic speeds would give us the ability to move anywhere in the solar system in a matter of days. And that opens the door to something NASA’s planetary exploration outfits can only dream of: rapid-response. Imagine if astronomers spotted an eruption on the surface of Europa—it’s happened before—and we could deploy a handful of spacecraft to investigate, right away. “You could imagine flying through a plume like this with a detector that could pick out biological material and organic molecules,” Worden said, adding that the expendability of the vessels means we could even impact a few onto the surface if we wanted to learn about the conditions that led to the eruption. And since we’re talking space geysers, let’s not forget about Enceladus’ south pole plume. 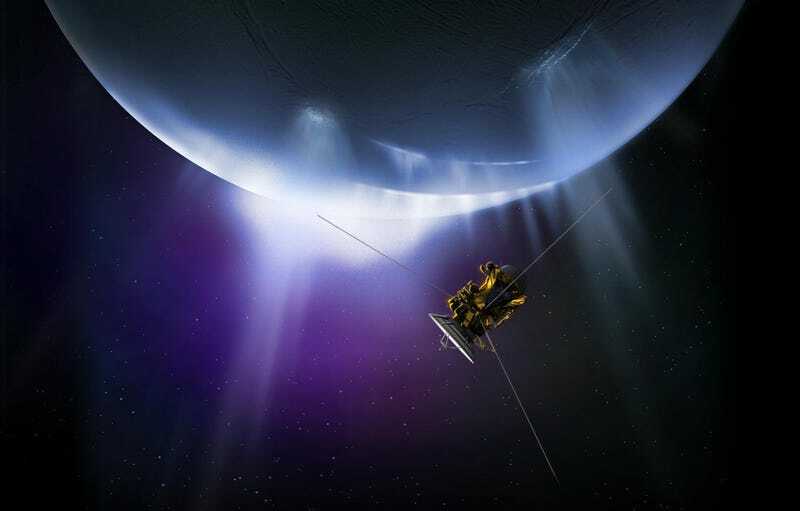 Astronomers have been itching to send a new mission there for years, one that could taste the alien salt spray for signs of life. With Milner’s moonshot, we could send hundreds. Tiny, fast moving space probes may also be our best, and only, shot at exploring the elusive Planet nine. It all sounds too good to be true, and maybe it is. As Gizmodo’s Darren Orf points out, the idea relies on some big assumptions about the inevitable progression of technology, plus the project’s ability to attract billions of dollars of investment. (That large, focused laser array ain’t going to come cheap.) Even Milner admits that the deployment of the first nanocraft missions is probably a “generation” out—a nice vague term that suggests the timetable isn’t at all certain. Then again, all of the ingredients needed to actualize Milner and Hawking’s vision—super tiny satellites, LightSails, laser propulsion—are now in some stage of development. Meanwhile, an ongoing revolution in the life sciences, toward miniaturization and automation, places the possibility of doing sophisticated molecular biology in outer space within reach. And the best part? Once we build our fancy, spacecraft-propelling laser array, the cost—in both dollars and time—of doing any and all science in space starts to plummet. Imagine launching a swarm of spacecraft to Mars in the morning, and receiving all of their reconnaissance data before you head home for dinner. With technology like that at our disposal, the aliens won’t be able to hide for long.